Why employee referrals are underutilized and why Teamable gives you a competitive edge. Congrats on making an investment in the number one thing that makes your company unique - your employees and the relationships they've formed throughout their lives. Everyone else is investing in the same tools, processes and talent pools (see the LinkedIn annual report chart below) and underinvesting in referrals. You should be excited about the way your recruiting funnel and company are going to transform. 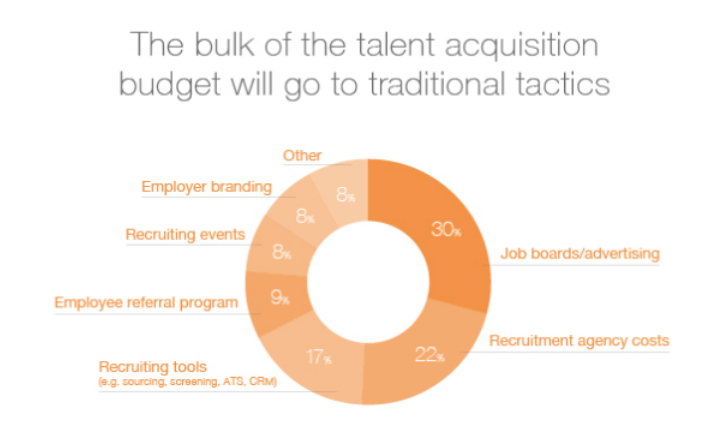 Figure One: Talent Acquisition budgets (courtesy of LinkedIn annual report). Why employee referrals? Every employee knows 10-100 great prospects based on people they've already connected with from school and former jobs. The problem is that not all of these people are top of mind, easily discoverable, or contactable. With Teamable, we automatically match your employee's shared connections with the open jobs in your applicant tracking system and make it easy for you to get a warm introduction to any prospect with just a couple of clicks. Warm referrals are more likely to respond, move through the hiring process quicker, are more likely to be hired, ramp up faster, are happier and more productive, better cultural fit, and, because of all of that, tend to stay at the company longer.